Le Duc sent me the link to a piece in the New York Times, introducing Hopp shoes, with the note, "I think you will like this". In Paris, I will cavort with the fashionable Huguette, she of the visit to the Boutique Where Nothing Fit Me. Huguette was recently prescribed a walking regime, as part of a cardiac health program. So, she bought a pair of Gelato suede ballerines, little shells that flopped like free pedi slippers. She loves them, saying, "I can walk in them! They are so comfortable." I guess moving from Michel Perry three-inch heels to these is an improvement, but it's relative. But obviously someone wants them; after the NYT piece, the shows they are now so sold out that there is a waiting list for the ramped-up production. I might spring for the Hopps but am also eyeing the Arche Ceonia, in pungent mustard, which would be fun to wear with my black-based travel palette. And you can wash Arche nubuck, which I've done for over 20 years, from sandals to boots. 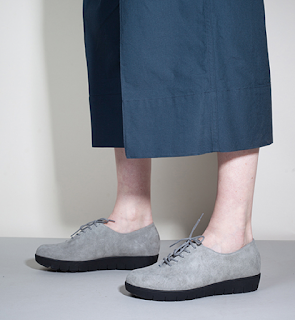 Huguette is a long way from accepting a serious walking oxford, but when I checked the SAS site (parent company to Hopp), I found a ballerina that has an arch, shock absorption, and a no-bite back. The "Lacey" ballerina is a similar price, about $245. (These look like fabric but are textured leather.) She'll be visiting me this summer, so maybe we can at least look. She also wants me to set up her FitBit Flex. I sent her the French manual, but she says, "zees things are 'ard for me", so I'll get her logged in. Regardless of what shoes she'll bring, we will walk through Montréal together. She is proud when she cracks thirty minutes, and I hope to gently egg her beyond that—but we shall see, and I'll report. One step at a time! I like your shoes. You should look at Waldlaufer shoes. They are incredibly comfortable, all leather and cheaper than your choices. I've been wearing them for several years now and I can even walk in the ballet shoes. I also can highly recommend Cole Haan ZeroGrand oxford shoes. I bought a pair for my bunion addled feet and love them. The colors are great, too. Check the sale tab for a much better price. Like you, I too love Arche shoes and boots, but didn't know I could wash them. Thanks for the great tip. I've been looking for supportive insoles for my Propét Mary Janes (black nylon; white sole) and found these at MEC: http://www.mec.ca/product/5014-027/superfeet-berry-insoles-womens/?f=10+50131+50418 The Propéts do have a removable insole. Once upon a time I had a pair of Waldläufers, but I've never seen them here; if I recall I bought them in Europe, on sale. Very good shoes. I love those Hopp shoes, but I am a little wary of the fact that they only come in whole sizes - this makes them riskier to order online. But maybe I will try once they are restocked! I was not aware I could wash my Arche shoes. Don't wish to be dense, but do you mean you put them in the washing machine? The Hopp shoes look promising! I really like those Hopp shoes and would wear them. Perhaps it is just the shades of blue and gray pictured though. I am leaning more and more toward shoes I can move in that are not black. I too didn't realize that I could wash Arche shoes. Cool. They look like women's Hush Puppies Oxfords. UGLY. When you say you can wash Arche nubuck, do you mean with a wet soapy cloth? Or a complete dunk underwater? Very intrigued as a pair of their MaryJanes, with their low-ish rubbery heel, are my go-to when I have to wear a heel. Love Oxfords. I have two pairs, one Gucci blue suede, flat heel, thin sole, and a pair of Tod's, black calf, flat heel, thin sole. I'll despair when the Guccis wear out (and I got them at a consignment store). The Tod's are sadly a little uncomfortable after a full day's wear, so I don't reach for them as often as I could. Love the blue Hopps which are nerdy indeed. Would wear them with jeans in white or blue, ankle visible. It' such a pity that I can't order from the US b/c of the additional costs. So I only can admire. Royleen, Leslie and Sisty: re washing Arche shoes, you can wash the nubuck models only. Use a plastic bucket with Ivory diluted in cool water, as if washing lingerie, and fully immerse them to soak for maybe a half hour. (A sink would work too, but not a washing machine, too much agitation.) You can •gently• scrub any stubborn spots. Pat dry to remove the sopping water, then place plastic shoe trees in them and air dry so air circulates, for example, in a dishrack. I have washed them like this for 25 years or so (not the same pair!) When I bought my first pair the salesperson told me how. This is especially good to know for the light colours like beige. I only wash the colours that look dirty, not black. 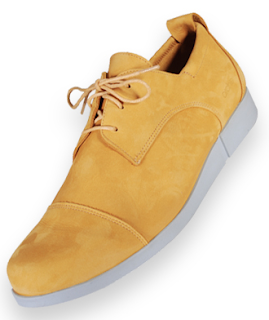 Leslie: I really like those Cole Haan oxfords; a friend has two pairs- but the last isn' right for me. They do look wonderful. annie: Maybe? They change every time I look at their eyes. But definitely higher quality than Hush Puppies. Barbra S.: I feel the same way and heavy things like shoes cost a lot to return! Nancy K. and lagatta: I will check out Waldlaufers. I have been musing about the thin line between "nerdy, but kind of cool" and "definitely orthopedic". What a thin line... that is why I have long bought Arche. Murphy: I am wondering if they will get into stores, I'd love to try them on. I recently bought a pair of Allbirds, a newish line of oxford style shoes from New Zealand. Made of merino wool, they are the most comfortable shoes I own - and they are machine washable/ air dry. Don't let the wool put you off them - they are not hot, and are most comfortable worn without socks. www.allbirds.com. threeloops: Thank you, I so appreciate readers sharing innovative products. They are like Glerups that got running shoe soles. I'll bet they are comfortable; I would like to try a pair. Currently they ship only to the US but if they are all they say, I'd expect them to ship worldwide soon.